Legislators in Oregon have recently changed the rules according to which repairers of motor vehicles can operate in the state. House Bill 4087 was signed on April 3rd, 2018. The main stipulations in the new law are that as of January 1st, 2019, a number of entities will need to post surety bonds if they want to engage in repair and other types of handling of motor vehicles. More specifically, you will need to get bonded if you are not a franchised motor vehicle dealer, don’t have a towing business certificate to transport and store vehicles, or are working in some relation to a lien against an abandoned vehicle. Below are the details that you should keep in mind about the amendments that the new bill introduces. As of 2019, if you want to engage in “making, altering, repairing, transporting, storing, performing services for, supplying materials for or performing labor in connection with a motor vehicle” (House Bill 4087), you may need to provide a surety bond. If you creates, attach, assert or claim the lien against an abandoned motor vehicle. In case you do not meet any of these three conditions, you are obliged to obtain a surety bond. The bond amount that would be required of you is $20,000. The purpose of the bonding requirement is to protect the interests of the state of Oregon and of your customers. The bond ensures your compliance with all applicable Oregon legislation. If you transgress from the state rules in your actions on making, altering, repairing, transporting, storing, performing services for, supplying materials for or performing labor in connection with a motor vehicle, a bond claim can be used to compensate parties that have suffered damages as a result of your actions. In order to get bonded, you do not need to cover the whole bond amount of $20,000. Instead, you only have to pay a small percentage of it called the bond premium. This is your actual surety bond cost. The bond price is formulated on the basis of your personal and business finances. When you apply with a surety, it has to examine closely your personal credit score, business financials, and assets and liquidity. The more stable your overall profile is, the smaller your bond premium is likely to be. Applicants with a good standing typically get a rate of about 1%-3%. This means your bond cost can be as low as $200 to $600. 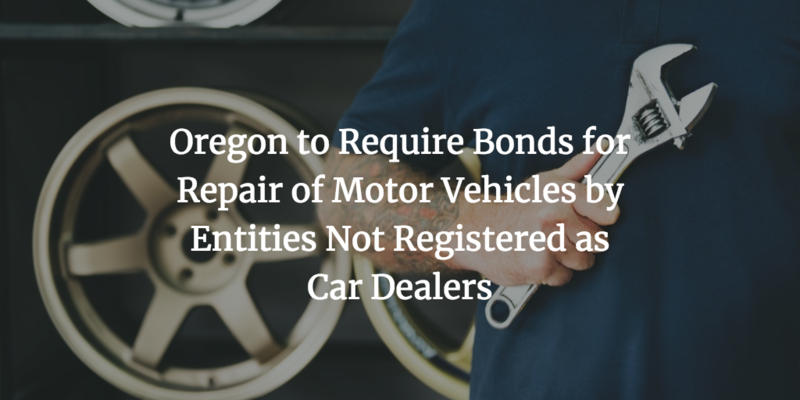 Do you have further questions about the new bond requirement for repairers of motor vehicles in Oregon? Don’t hesitate to contact us at 877.514.5146.